So I spent the day flying in very light wind and worked on the JL all day. Here is what I found. 2. Lateral roll out was most reliable when not setteling in the fade, directly rolling out. Kept the kite square. Rolling out from the held fade I was having keeping the kite square. 3. Popping into the turtle not really an issue and getting it deep was good. 4. While in the turtle the kite lost altitude so fast that when I did the half lazy I couldn't get the fade. Any tricks about keeping altitude in the turtle. Maybe I'm just trying to be too slow with the whole manuever. Speeding up the fade to roll out worked great, I need to try and speed up the lazy to get into the fade to be able to regain altitude? By the way, I'm having a blast.. Note to NP: I flew with a good friend today. Glen was here and he got seven other flyers out and we had a ball. Not bad for a Monday, of course I had to call in sick but what a way to spend a sick day. I'm trying even if the wind hasn't been perfect. I want to be able to fly in all winds not just that elusive perfect condition. Yesterday was a strange wind day for sure. We had everthing from indoor kites to SUL's and UL's up with very flakey variable breezes. I was doing helicopters with indoor kites and flying the freestylist (challenge). It was the type of day that helped me understand low wind flying techniques. The low wind capabilities of a kite is without doubt pilot dependent. Before yesterday I probably would not have tried to fly in the light conditions we had for alot of the day. In the future I will welcome the challenge. The wind came up several times throughout the day to try the JL but was still really bumpy and unpredictable. But my techniques should shine when I do get good wind because I'm pretty close in the crappy winds. I'm not so sure that Dawn would try it..
We're off to the park tomorrow hoping for a good wind day. I am going to start my day down at the water however I don't have my bucket ready yet. I had broken a lower leading edge on my Widow Maker UL somehow while it was in the bag and just got it fixed tonight. I havn't had it with me the last couple times I have flown and I'm hoping I can JL it with some consistantcy. Gonna give it a go if the wind is good. Nope, got to the beach early and not a wisp of wind to be had. We stayed all day and the wind just never happened. Really strange day. I did fly my Prism Vapor on really short lines and the wind was low enough to fly up and over and 360. Family had fun riding bikes and playing at the beach. Stayed home and made soft pretzels today as it is raining. Same here in Atlanta, not a bit of wind to fly anything except a helium filled balloon. Captainbob, that's what I need to add to the bag, some helium and balloons. I worked for a Belgium company for almost 20 years, which got me hooked on good beers, most of them dark. Love Porters, Stouts, and there are many great Craft beers now in the US that compare favorably with the best Belgium beers. Our family spent this last Christmas in Munich where I was in hog heaven tasting all of the incredible Dark German Beers. My current local favorite is Black Butte Porter from Oregon. np... nice Freestylist. On my wishlist is a WM UL, but I find that the stats for the WM UL and the Freestylist UL are about the same. I'm like CaptainBob in that I don't trick much in my piloting. I haven't flown either kite. Which do you prefer? Nice vids CaptianBob. I like the red Freestylist. Trip......There must be some confusion, as I don't own a Skyburner Freestylist. I'm like CaptainBob in that I don't trick much in my piloting. I haven't flown either kite. Which do you prefer? I choose and buy my kites to trick and don't like to recommend which kite for YOU to buy. I will say this: If you're not going to trick, then you don't need a $300.00+ kite to fly ribbon tails or figure eights. Myself I think you and Capt. Bob should start tricking. It's not easy, especially on us "old guys", but it will hold your interest a lot longer than pulling tails. I would be more than happy to send you some video links of some the "trick challenges" I offered to Beginners in this forum. 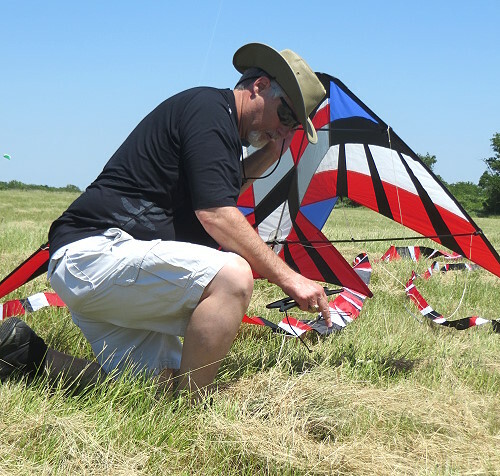 Before you purchase either of the kites you mentioned above, be SURE you know what you are going to do with it, even if it's because of the particular wind you encounter where you fly. My apologies np.... I looked back and saw where you stated in your original post that you flew a Freestylist... not own one. However, I wasn't asking which kite you think I should buy, I was asking which YOU prefer. Big difference. I know you don't know me very well, but I don't buy kites on a whim. Before I consider buying any kite, I like to do the research and ask questions. The two kites are similar in style and ability. I have own them both, they are more similar than dissimilar. Both kites can do all the tricks I know. As your trick skills develop you may outgrow the Freestylist. For precision flying both will work well. The WM is a world class kite with a build quality to match. An example is the extensive nose detail to avoid line snags. The freestylist has a simpler sail design and construction to reduce cost. Trip, I own both and I bought the Freestylist from Wayner. Both the WM UL and Freestylist UL are fantastic kites and as Wayner stated they are very similar. In your statement you mentioned that tricking is not your thing, not sure if you are wanting to develop into tricking so here is my opinion. If you want to trick then either kite would be great as they are very capable. If you don't envision tricking I would recommend looking for a kite targeted at precision. Depending on your local wind conditions you need to decide on Std., UL, SUL, or Vented. Lots of great kites out there at reasonable prices to maybe have a variety of the above for varied conditions.